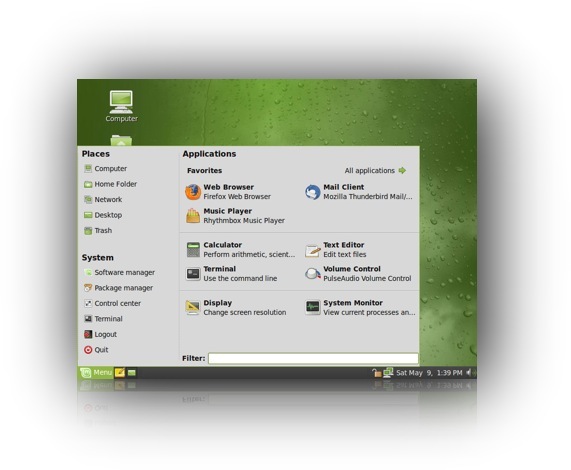 Linux Mint, which is at version 7 now, is based on Ubuntu which itself is built on Debian. So we're in excellent company here. Linux Mint contain codecs for most of the media files (audio / video) found on the Internet out of the box. The user interface is gorgeous and really feels like something that has been designed by someone who really knows about user interaction. For example, Mint has a menu (pictured above) which contains selected applications (favourites) and which is 100% customisable. It's much better (IMHO) than the default Gnome menu. There is an application which shows all software available in Linux Mint with screenshots. What is great is that this list can be sorted by popularity. It's a great way to discover open source applications which are used by a lot of people and which you don't personally know about. Compiz (as well as the proprietary Nvidia driver in my case) is preinstalled and is sensibly configured: not a lot of eye candy but, instead, a pragmatic choice of settings to make Gnome more usable. aptitude! I love anything .deb-based. I'm really impressed by Linux Mint. This is the only distribution I use at home. At work I use CentOS Linux because, well, it is great for a business environment. But I might replace CentOS on my own computer there with Linux Mint. Just don't tell anyone. 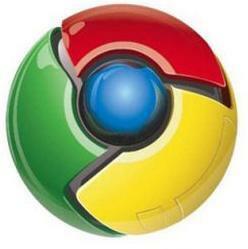 What do you think of Google Chrome OS? 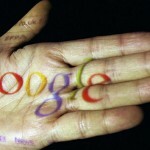 Two days ago, Google announced the Google Chrome OS (Operating System) project. Our friend, Fake Steve, is adamant that building Google Chrome OS is not a good stategy for Google. In my opinion, he is correct when he questions the business logic of Google. You see, Chrome OS is going to be free (like most Linux distributions), has one good browser (like most Linux distributions), with good support for Google apps (like most Linux distribuions) but is going to be costly to build for Google (unlike most Linux distributions which exist already.) So why build yet another Linux distribution (which is what Google Chrome OS is in essence...) Why don't Google use something which exists already? Other Ideas (Tout ce qui peut apporter une contribution). N'hésitez pas à poster vos idées ! 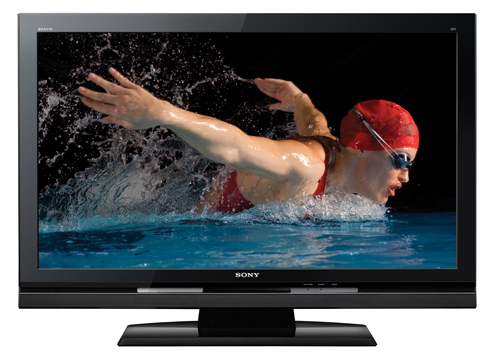 How many of you would like to get an LCD TV for Christmas? A lot, I bet. How many of you know that the Sony Bravia LCD TVs are powered by Linux? A lot fewer, I guess. Les distributions pourraient se disposer sur les rayons des supermarchés tellement elles sont nombreuses. On en trouve pour tous les gouts et toutes les couleurs. D'une classique Ubuntu, installable les yeux fermés à une LFS qui nécessite de faire un peu d'assembleur avant de démarrer. Pour ma part je pense que Gentoo propose une bonne alternative pour les Geeks en mal de pouvoir de compilation avec des ordinateurs toujours plus puissants. Mais pourquoi se priver du plaisir de la compilation ! After years and years of inactivity (let's be honest! ), the LUGM website is alive again! As you can see, this is a blog and I expect you to make it become alive with a lot of insightful and passionate comments. Of course, we'll also participate in the discussions. As you all know, the Linux User Group of Mauritius has a number of objectives namely (i) advocate (ii) support (iii) educate and (iv) make people meet. During the coming months, we will make a number of important announcements concerning events that we intend to organise... with your help! Stay tuned. When LUGM started 10 years ago, Linux was still a curiosity... especially here in Mauritius. As a matter of fact, I got into Linux myself par hasard. I had a Windows NT server around 1999 and it was tough to configure (in fact, a lot of things were not working properly.) I stumbled upon a copy of the PC Quest magazine with Redhat Linux 6.2 as cover disk. Little by little, I migrated all the services from the NT box to a Pentium 133 with 32 Mb running the Redhat Linux 6.2 and everything worked great. I then decided that life was too short to care about NT and became a Linux addict. But Linux was fun! I really enjoyed learning about the UNIX way of doing things. It is then that I decided to share my passion with others, first by announcing the launching of this Linux User Group then by introducing my students to Linux. I remember deploying Linux to the Mauritius Chamber of Commerce and Industry and the University of Mauritius to great effect. Many of the students loved Linux as it allowed them to explore areas of Computer Science that they were not really aware of. 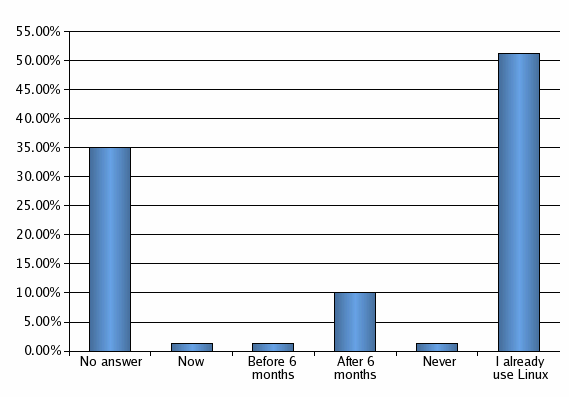 On the commercial front, we did a survey on the use of Linux in Mauritian companies in 2003 and the results are still interesting to read. Linux is now a common occurrence in Mauritian companies. And this is true for a lot of open source software too. Of course, most of the desktop computers still run Windows (and I expect this to continue for some years until everyone becomes mobile) but a lot of the largest servers in the country are powered by Linux. Interestingly, a lot of devices being used by Mauritians all day long (e.g. the Mauritius Telecom Livebox and the Sony Bravia LCD TVs) run Linux. It all depends on you. What do you want us to do? 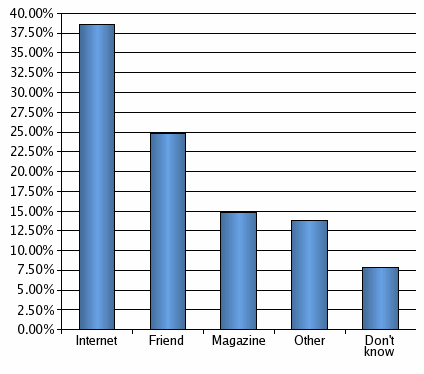 The results: Heard about Linux ? How did you discover it ? We see the ever increasing role of the Internet as a means fo propagate knowledge. Where do you use Linux ? 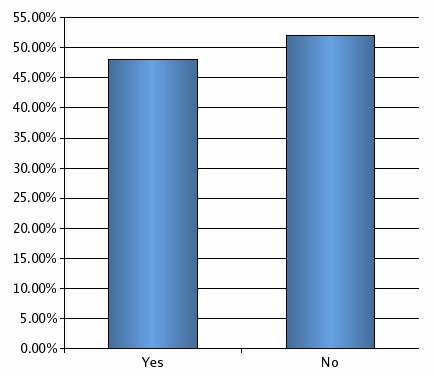 38% of the IT managers questioned do not use Linux, neither at work nor at home. This seems to indicate that Linux is being used as a server operating system. Pattern of use of distributions in Mauritius is exactly the same as worldwide. 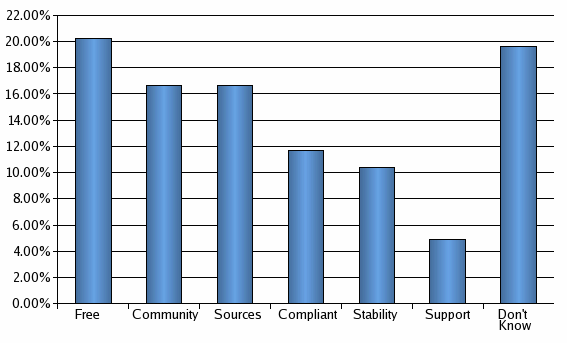 Surprisingly, the type of application mostly used is Office applications (presumably Star Office and Open Office). 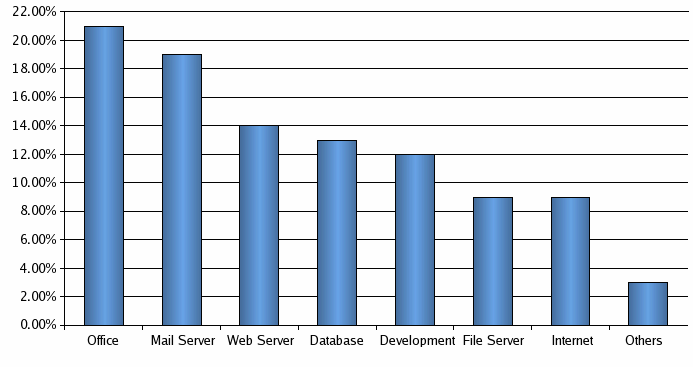 On the other hand, server applications (Mail, Web, Database and File Servers) amount to 55% which is coherent with the deduction made previously. What about paid support ? 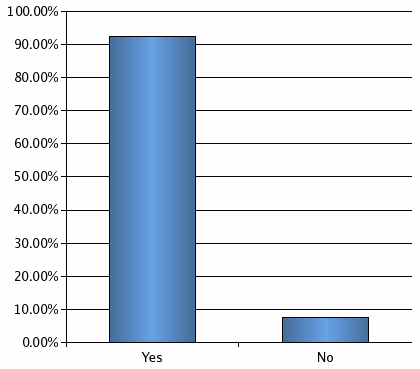 A majority thinks that Linux support should not be commercial. 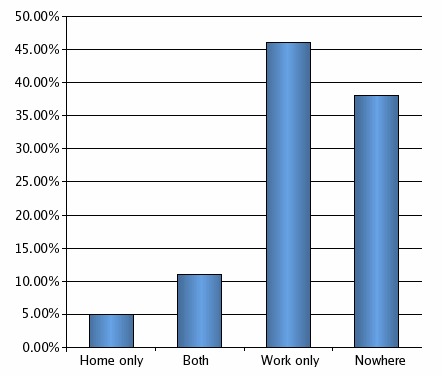 This is very surprising given that most of those questioned use Linux at work. 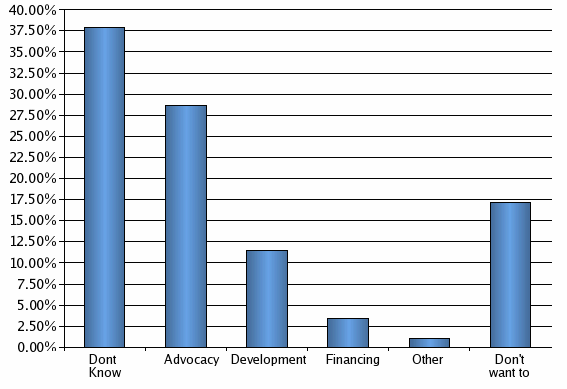 An interpretation is that they are satisfied with the level of support they get in forums and websites. Unfortunately, 35% do not know whether they’ll do it or not. They are the ones we need to convince. 38% do not know how to help. And about 20% do not want to help. Linux and Open Source is all about give and take !!! 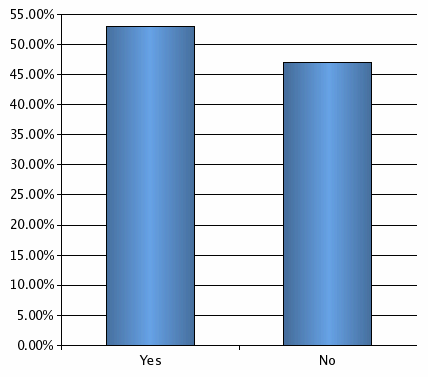 55% of Mauritian IT managers know that LUGM exists. 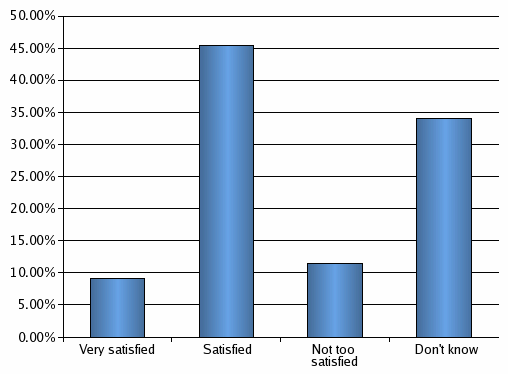 About half of those who know LUGM are satisfied with it. It is important that those who are unsatisfied with LUGM’s actions come forward and make proposals. do not contribute to the OSS movement. 1) Linux is free ! Linux distributions can be obtained freely and copied at will. 2) Linux is open source ! The sources of Linux and thousands of other open source applications are readily available. 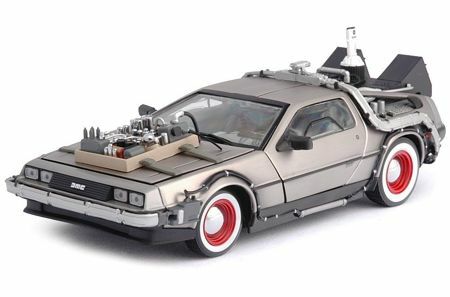 Learning to build software becomes easy just by looking at those examples. 3) Linux has a community of users ! Linux is not only an operating system but also an extensive community of users willing to share experiences and support each other. The Linux User Group of Mauritius (www.linux.mu), among others, represents this community in Mauritius. Extensive user documentation created by fellow Linux users exists on the Internet (www.tldp.org). 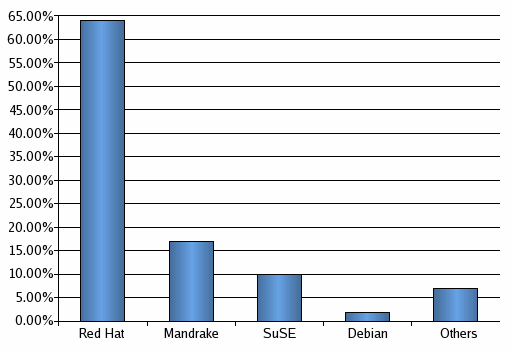 4) Linux runs thousands of software ! A Linux distribution typically contains loads of software (e.g. Redhat Linux 9 comes with 1402 software packages) and many more can be obtained on the Internet (e.g. on www.freshmeat.net and www.sourceforge.net). Most of these software packages (e.g. productivity, graphical, educational, software development or Internet applications) are free. 5) Linux is robust, secure and efficient ! Linux has been designed to be very robust (it recovers gracefully from the whole range of exceptional situations), secure (every user can have private files and specific privileges) and efficient (it can be used on previous generation computers like 486s and Pentium I). Some very well-known companies now use Linux for their processing needs (e.g. Amazon, Google, the NASA, the CIA and even our own Mauritian Servihoo). 6) Linux is based upon open standards and open protocols ! 7) Linux is compatible with everything else ! Linux can easily coexist and work with all kinds of alternative operating systems systems (like Unix, Windows, MacOS...). Linux applications can also read and write files in proprietary format (like .doc or PDF). Linux can even run some Windows applications (most notably office applications). 8) Linux is an excellent environment to learn programming ! A Linux distribution comes with numerous software development environment and compilers (for C, C++, Java, Python, TCL/Tk, Fortran, Ruby...). Java 2 Enterprise Edition is also available through the freely available J2EE implementations from Sun or JBoss. With the availability of the two leading open source databases in most distributions, PostgreSQL and MySQL, a student has all the tools required to learn to build extensive enterprise software applications. 9) Linux can be easily administered remotely ! Every computer running Linux can be administered remotely using the very secure SSH protocol. This means that all eventual maintenance and installations can be done remotely. This implies that every school need not have a local system administrator. 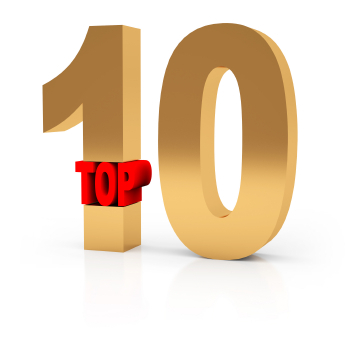 10) Linux is being promoted by some very well-known companies ! IBM (www.ibm.com/linux), HP (www.hp.com/linux), Oracle (www.oracle.com/linux), SAP (www.sap.com/linux), Sun (www.sun.com/linux) and other well-known companies are heavily investing and developing products for Linux. 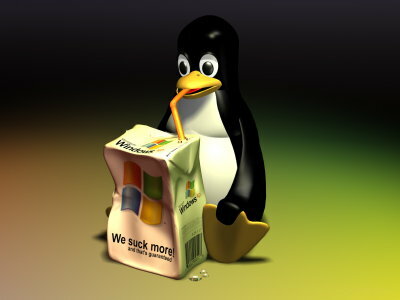 This clearly shows their trust in Linux. Linux is the future ! Thanks to all those who have contributed ideas and to Yash Nursinghdass in particular. Ce texte vise à introduire l’historique de GNU/Linux et des Logiciels Libres et ’Open Source’ ainsi que leurs avantages de façon succinte. Strictement parlant, il serait plus correct de commencer chronologiquement par GNU et Richard Stallman. Cependant, j’ai préféré mentionner le plus familier avant d’aborder les parties moins connues afin de permettre au lecteur de mieux faire les connexions de lui-même. Linux est aujourd’hui un système d’exploitation compatible avec les normes Posix (et on peut dire compatible avec les systèmes et logiciels UNIX) très sécurisé, très rapide et très robuste, et en plus gratuit, dont le code source est disponible. Linux fut d’abord un noyau de système d’exploitation, conçu et développé à l’origine uniquement par un jeune étudiant Finlandais, Linus Torvalds. En 1991, âgé de 26 ans, en deuxième année d’études en Sciences Informatiques à l’Université de Helsinki, Linus Torvalds débuta le développement sur une machine abordable avec un processeur Intel 386, mais ensuite, décida aussi de mettre le noyau ainsi que son code source à disposition d’autres personnes gratuitement, en les rendant accessible via Internet. Les grands délais associés au développement du système d’exploitation du projet GNU lancé presque neuf ans auparavant par Richard Stallman. La disponibilité du code source au public fit qu’un nombre grandissant de personnes détectèrent des améliorations possibles et aussi envoyèrent leurs propres ajouts au code de Linus. Ainsi, le système Linux a toujours été continuellement amélioré depuis, grâce au travail de très nombreux collaborateurs de diverses parties du monde. Les collaborateurs travaillent de façon volontaires, et très souvent durant leur temps libre. Plus de dix ans plus tard, de nos jours, Linux est un système qui est grandement utilisé dans tous les domaines ou sont nécessaires une fiabilité, une sécurité, une robustesse, une rapidité accrues, ainsi qu’une approche économiques avec en plus la possiblité d’adapter le code source. De nombreuses compagnies commerciales ont migré leurs opérations et leurs logiciels vers Linux pour des raisons de fiabilité, de rapidité, de sécurité, de robustesse et d’impact économique positif. En effet, de nombreuses séquences à effets spéciaux dans les films récents sont produits sur des logiciels tournant sous Linux. IBM est un grand supporter de ce système d’exploitation. Oracle, PeopleSoft et SAP ont tous commencé la migration de leurs produits sous Linux. Une licence particulière décrit ainsi l’utilisation du code source de Linux. C’est la licence GPL : la GNU Public Licence, qui stipule, entre autres, que quiconque modifie le code source mis à disposition a le devoir de réinjecter le nouveau code source dans la communauté des utilisateurs. GNU est un projet préexistant à Linux, de Richard Stallman, un étudiant de Harvard qui a travaillé pendant longtemps aboratoire d’intelligence artificielle de MIT, le AI Lab. Dans l’environnement de AI Lab, il existait déjà une culture de partage de codes sources afin que tous les employés puissent apporter leur améliorations afin que la communauté internet au AI Lab en bénéficie. Ainsi, de nombreux problèmes avec les machines et les logiciels de l’époque furent réglés par ces collaborations et ces ententes tacites en plus de l’approche de partage de codes sources. En 1983-1984, Richard Stallman fit de cette façon de procéder un projet, qui deviendra son projet de vie, son chef d’oeuvre en quelque sorte. L’idée de GNU est de produire et de promouvoir une combinaison de Système d’Exploitation et de Logiciels Libres compatibles UNIX, gratuitement si possible ou pour des sommes modiques à tous ceux qui en ont besoin. en utiliser une partie dans un autre travail, même non libre. Richard Stallman fonda par la suite, la Free Software Foundation, FSF, spécifiquement pour promouvoir les notions de liberté liées aux logiciels. De par son effort personnel initialement, et ensuite de par la contribution de centaines d’autres personnes de par le monde, le projet GNU se voit depuis son lancement, grandir en termes de logiciels libres disponibles. Par exemple, GNU Emacs, l’éditeur personnalisable, et GCC, l’ensemble de compilateurs GNU, sont des produits de Stallman à qui d’autres ont contribués. Cependant, le Système d’Exploitation prévu par Richard Stallman, le GNU Hurd, fut très longtemps en développement ce qui rendait une bonne partie de son projet incomplet. En effet, bien que les logiciels GNU devenaient plus nombreux et disponibles, il fallait encore utiliser les coûteux environnements UNIX pour les utiliser alors que Stallman voulait démocratiser l’accès au couple Système d’Exploitation et Logiciels. C’est donc grâce au mariage des concepts et des application GNU au système d’exploitation Linux, que purent se concrétiser les rêves de Richard Stallman. Ce dernier d’ailleurs insiste toujours à raison que ce que l’on appelle communément une distribution Linux devrait en fait être plus correctement nommé GNU/Linux. L’avènement de Linux a aussi fortement bénéficié des possibilités de collaboration à distance offertes par le noyau Internet Pré-Web de la période 1983-1995 (e.g. les listes de diffusion, Usenet, etc...), mais ensuite aussi des possibilités de collaborations grâce au Web, tels que SourceForge et d’autres environnements tels les forums de discussions. Eric Raymond est un de ces contributeurs au projet GNU. En l’occurrence, il a développé le logiciel SendMail. De plus, il est un fin observateur des processus de collaboration et de développement qui sont particuliers au domaine GNU/Linux et Logiciels Libres. Plus précisément, dans ses textes, dont "The Cathedral and the Bazaar", il décrit comment d’après-lui, l’approche partage de code source et collaboration ouverte a permis le développement de l’ensemble complexe GNU/Linux, alors que beaucoup de compagnies commerciales, ont des équipes entières de développeurs qui se cassent les dents sur la complexité grandissante des logiciels. En d’autres mots, Eric Raymond pense que ce qui explique la plus grande fiabilité, sécurité et robustesse des logiciels développés avec cette approche collaborative particulière, c’est bien l’aspect développement ouvert avec code source disponible. Ceci s’explique en partie pour lui, par le fait que vu le nombre de collaborateurs grandissant, pour au moins une personne dans le monde, tel ou tel bug, sera une chose triviale à régler. Et dans le développement de logiciels, même si les temps de développements peuvent être estimés, la découverte de bugs et leur élimination sont souvent des inconnues. Et en vérité, il existe des exemples où certains bugs liés à la sécurité furent éliminés en une période d’une journée grâce à un ou plusieurs collaborateurs via Internet. Cette grande réactivité est à comparer avec une compagnie commerciale, qui d’abord nie l’existence du bug, pour ensuite prendre deux semaines ou plus pour de régler le problème. Pendant ce temps, l’utilisateur du système se retrouve avec un environnement vulnérable. Lorsqu’en 1998, Netscape annonce la mise à disposition du code source de son browser Web, cela est interprété par Raymond comme le premier exemple provenant d’une compagnie commerciale, de l’acceptation de la supériorité du modèle ’Logiciel Libre’ et partage de code source si prisé par Stallman, Torvalds et les nombreux collaborateurs des environnements GNU/Linux. De plus, il réalise alors qu’il est peut-être nécessaire de mieux moduler et exprimer les concepts car il apparaît alors que le futur sera fait de plus étroites collaborations entre les compagnies commerciales et les collaborateurs souvent altruistes et non-commerciaux des projets GNU/Linux. C’est ainsi qu’il décide d’adopter les termes ’Open Source’ plutôt que ’Free Software’ que propose toujours Richard Stallman. Mis à part certains détails fins, dans l’ensemble ces deux termes peuvent être interchangés sans problèmes dans de nombreux cas. Cependant, il semble que les termes ’Open Source Software’ sont plus courants que ’Free Software’ de nos jours. C’est ainsi que Eric Raymond formalisera ’The Open Source Initiative", un organisme qui décrit les avantages des logiciels à code source ouvert. GNU/Linux est présent à Maurice dans divers secteurs. Cependant il est probable que GNU/Linux bénéficie d’une faible visibilité. C’est dans l’optique de mieux faire connaître cet sphère, le Système d’Exploitation Linux, les Logiciels GNU, les Logiciels Libres et ’Open Source’ qu’est écrit ce texte. Les enjeux et les avantages pour divers secteurs du pays, voire pour les projets specifiques et stratégiques du pays sont nombreux. Prenons l’exemple du projet CyberCité : tous les produits GNU/Linux sont fortement basés sur des Standards et des protocoles standards qui sont le coeur même de la communication Internet. Mieux encore, des études ont démontré que certaines des implantations des protocoles standards dans les produits GNU/Linux sont les meilleurs au monde (e.g. la pile TCP). Cela veut dire que l’adoption de GNU/Linux prépare d’autant mieux le pays à s’intégrer dans la nouvelle économie à l’échelle mondiale dont une très grande composante est le commerce électronique via Internet, avec un investissement économique optimisé. Ceci, d’autant plus que certaines compagnies commerciales sont connues pour leurs pratiques monopolistiques, visant à continuellement augmenter le prix de leurs logiciels, ou enfermer les utilisateurs dans soit des licences qui les exploitent soit dans des protocoles non-standards. Il est d’autant plus important de faire une bonne évaluation en ce qui concerne les projets spécifiques et stratégiques gouvernementaux car les coûts seront souvent répercutés sur les contribuables. Les gouvernements de nombreux pays étrangers ont décidé de soit évaluer de près les alternatives GNU/Linux ou de les adopter dans leurs projets. On peut notamment citer le Pérou, la France, l’Allemagne, les USA, la Chine, l’Afrique du Sud, l’Angleterre, et de nombreux autres pays. Si vous êtes dans le Gouvernement, le Secteur Privé, le secteur de l’Education ou utilisateur individuel, pour avoir plus de renseignements concernant GNU/Linux, les Logiciels Libres et ’Open Source’, il est fortement recommandé de visiter régulièrement le site du M.L.U.G. (voir ci-dessous). Le Linux User Group of Mauritiu au travers duquel ce texte a vu le jour. Pour plus de renseignements sur GNU/Linux et les Logiciels Libre et ’Open Source’, il est fortement recommandé de visiter le site régulièrement voire de s’inscrire à la liste de diffusion. IBL, qui représente la compagnie commerciale Red Hat qui vend une distribution GNU/Linux réputée, et partenaire d’IBM qui est un grand promoteur et vendeur de produits Linux. TuxCafe, qui est une cybercafé entièrement constitué de machines tournant sous GNU/Linux. What’s so bad about Microsoft ? What alternatives are there to Microsoft ?